HeuristicLab supports tree-based (Koza-style) genetic programming. This classical form of genetic programming uses a tree data structure as representation of solution candidates. The data types and operators to work with tree-based solution candidates are implemented in the plugin HeuristicLab.Encodings.SymbolicExpressionTree. The symbolic expression tree encoding contains the implementation of the problem independent data structure (a tree of symbols) and operators. Based on the encoding we implemented three well-known GP problems. Symbolic regression is a particular variant of data analysis. The goal is to find a functional expression of any form which estimates the values of a specified target variable (continuous) based on values of a set of input variables (discrete/continuous). It is thus similar to linear regression, however, in linear regression the structure of the model is predefined (linear combination of the input variables) and only the parameters for the model have to be estimated while in symbolic regression the structure of the model is unconstrained and the structure as well as the parameters have to be determined. This is a problem that can be solved by genetic programming. The symbols that can be used in symbolic regression models is problem dependent. So these symbols (mathematical operators: +,-,/,* ... and operands: constants, variables) are implemented in the problem specific plugin HeuristicLab.Problems.DataAnalysis.Symbolic. Evaluators for these problem-specific instances of symbolic expression trees are also implemented in this plugin. HeuristicLab provides many possibilities to analyse the resulting symbolic regression solutions. Some of them are shown in the screenshot. The goal in symbolic classification is to find a model that estimates the target class value (discrete) from the value of input variables (discrete, continuous). In our implementation the models for symbolic regression and symbolic classification can contain the same symbols (operators and operands). Thus we actually evolve a discriminating function for the classes and later any threshold value can be used to map the continuous output of the discriminating function to the actual class values. However, we provide a number of additional accuracy metrics and output visualizations that are useful for classification solutions. Some of them are shown in the screenshot on the right side. The artificial ant problem is a very simple implementation of a genetic programming problem. Right now we only provide the Santa-Fe ant trail as problem instance. 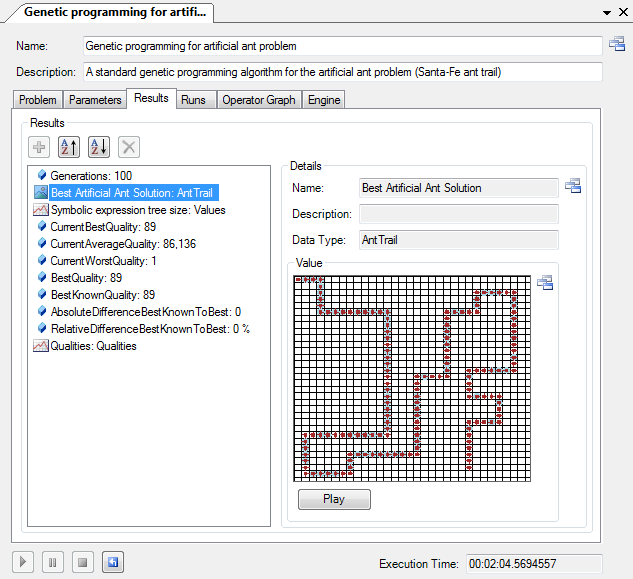 The implementation of the artificial ant problem can be used as a reference implementation when you want to implement your own plugin for genetic programming. It shows how to define the problem-specific symbol set and a grammar which defines valid tree structures. 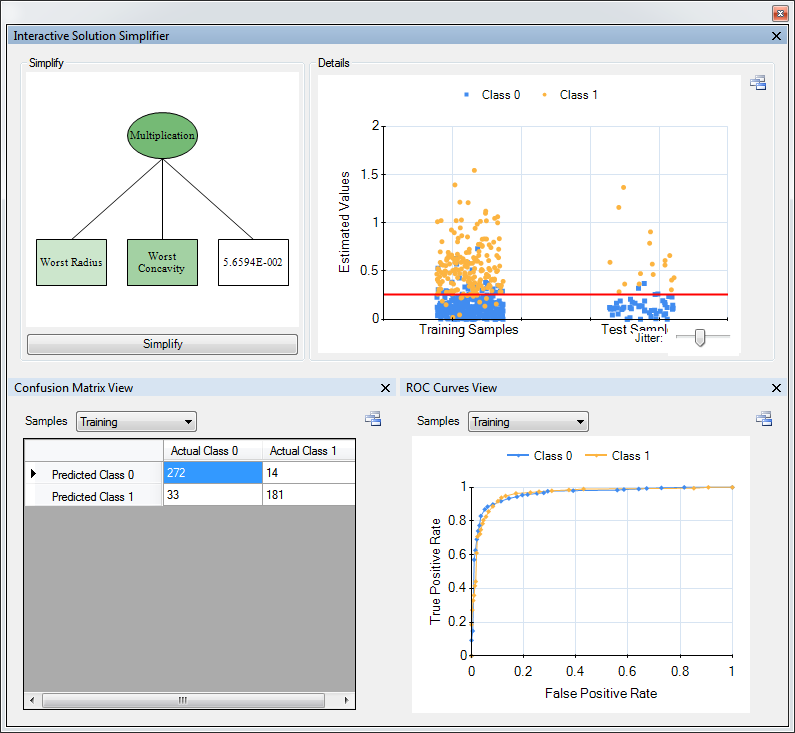 It also contains a problem specific evaluator and solution visualization. On the right you can see the solution visualization for the artifical ant problem. Because of the strict separation of the implementations of algorithms, problems, and encodings in HeuristicLab. It is possible to solve symbolic regression of symbolic classification problems with all population based algorithms using either a crossover or manipulation operator to evolve solutions. The algorithm that comes closest to the original formulation of genetic programming by Koza is the genetic algorithm. In the future we plan to implement move operators for the symbolic expression tree encoding. This would make it possible to solve genetic programming problems also with trajectory-based algorithms like tabu-search, particle swarm optimization, or variable neighborhood search. Solutions for symbolic regression or classification problems can be exported in different formats to make it possible to use the discovered formulas in other software. Currently we support several textual export formats for data analysis models such as MATLAB, LaTeX, and Excel, as well as a generic prefix symbolic expression tree notation. It is very easy to implement your own formatter if necessary. 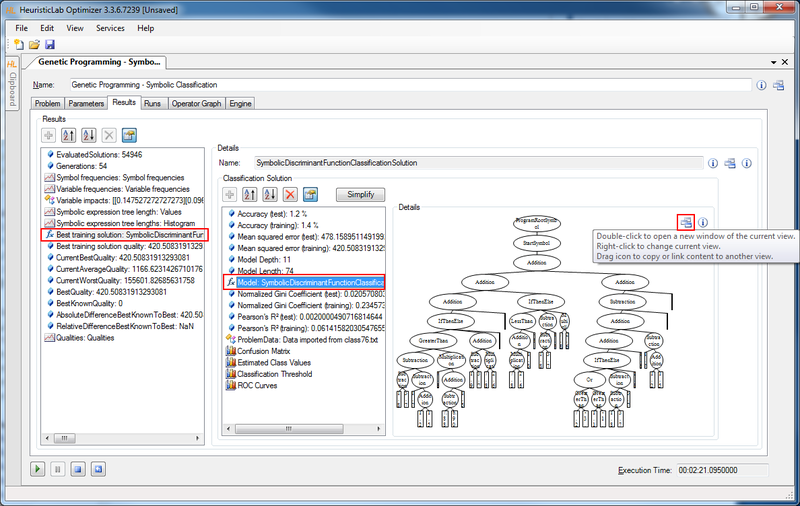 The export functionality can be accessed via the ViewHost icon of the model view as shown in the screenshots below. Select the model of the discovered solution. 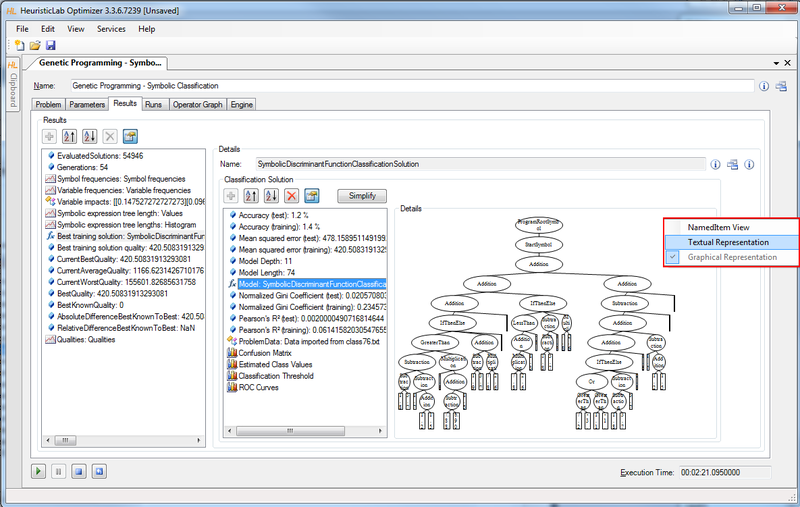 The default view for the model shows the tree in a graphical form. Select the desired export format in the drop-down box. We also provide an implementation for automatically defined functions (ADFs) as described by Koza. 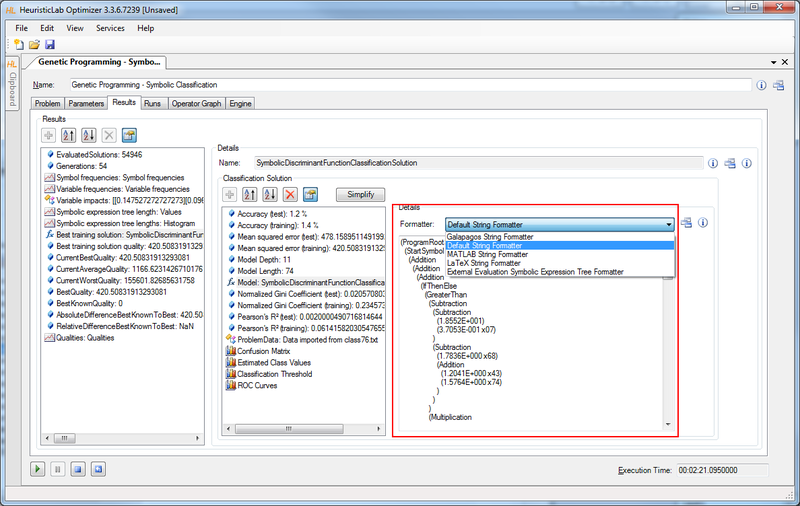 Automatically defined functions allow to extract useful code fragments into a separate function which can be called multiple times either while executing the result producing branch or another ADF. ADFs are created and manipulated by architecture altering operators while evolving genetic programming solutions. This means ADFs underlie selection pressure in the same way as the main result producing branch and the evolutionary process determines if ADFs survive in the final population and which code fragments are moved to ADFs. Supporting ADFs fully and correctly is not easy and lead to many non-trivial changes in the data types and operators for symbolic expression trees. model_export1.png​ (158.4 KB) - added by gkronber 7 years ago. model_export2.png​ (139.2 KB) - added by gkronber 7 years ago. model_export3.png​ (127.2 KB) - added by gkronber 7 years ago.